Japanese prodigy Mizuki Inoue makes her American MMA debut July 13thagainst fan favorite Bec Hyatt at Invicta FC. Roughly one month before her 19th birthday, Inoue will have the chance to prove she is a true warrior. With a desire to win world championships in MMA, Shoot Boxing, and Kick Boxing, Inoue will try to take a large leap towards that goal on July 13th. Having already won a world title in Shoot Boxing, Inoue believes the only way to be a true martial artist is to be great at all disciplines. Corey Smith: Outside of the United States, Japan has one of the strongest female mixed martial arts scenes in the world. How did you first enter into mixed martial arts? Mizuki Inoue: I began karate when I was in fourth grade, and I made my pro debut at age 15 as a kick boxer. But Chairman Yamaguchi (of Hakushin-kai) had this philosophy that “if you want to be the best fighter in the world then you have to do MMA” so, I actually have been training MMA for a while now. Probably over five years. 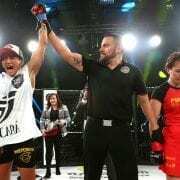 MI: Japan does have a strong women’s MMA scene but from watching fights outside Japan I feel we are behind in the strength department so I have been working on gaining more power. CS: You have quickly amassed a MMA record of 5-1 to go along with a kickboxing record of 4-1. What has been the moment you are most proud of so far? MI: From the very beginning I have been saying this in public; I want to win titles in three different disciplines which is MMA, kick boxing and Shoot Boxing. MI: And by winning Shoot Boxing’s S-Cup tourney last year I achieved one goal, so that has to be my biggest achievement so far. CS: You are also 4-1 in your Shoot Boxing career. For those unfamiliar with Shoot Boxing, what are the major differences between it and MMA? How are they similar? MI: Shoot Boxing is so-called “Standing Vale Tudo”. It’s like kick boxing plus throws and standing submissions. MI: Since I am from karate, many fans think I am a kick boxer or a Shoot Boxing fighter but I consider myself a MMA fighter. I decided to fight in Shoot Boxing as part of my path to become a better MMA fighter. CS: Have the varied rules you have competed under been a result of a lack of willing opponents in MMA, or do you have a desire to test yourself in all disciplines? MI: My master, Chairman Yamaguchi (of Hakushin-kai) believes that the best fighters in the combat sports are MMA fighters. Meaning, if you are a fighter then you have to be able to win MMA fights otherwise you are not the best fighter, and I agree with that. So, in order for to become a MMA champion I am willing to train any discipline. CS: This will be your debut fighting outside of Japan. Do you anticipate any extra difficulties fighting in another country? What are you doing to prepare for the travel? MI: Honestly right now I am too busy training so I am not really thinking about a long flight or jet lag or anything like that. Not yet (laugh). MI: But this is going to be my first trip outside Japan, so I am excited. CS: You will be making your Invicta FC debut against fan favorite, Bec Hyatt. How familiar are you with Hyatt? What areas will you focus on in your training camp? MI: I’ve seen her fights in Invicta FC. I think she is very aggressive. I can tell she has got a very strong heart, and she is a very good striker. MI: So, I think she is going to attack me with her punches, and I am prepared to go toe-to-toe with her. CS: What does a typical day in training camp consist of for you? MI: I do a couple hours of weight, strength straining in the afternoon and I do about five to six hours at night. Mainly sparring though. CS: What is your mindset on the night of the fight? What type of routine do you have before the fight? MI: Before the fight, in my head, I just go over the strategies and also, I tell myself things I cannot do, etc. MI: I am usually pretty calm before the fight. I am just concentrating most of the time. MI: Well, in Japan I can hear Chairman Yamaguchi’s voice clearly because usually the audience is quiet, but in the US I guess that is not the case right? MI: So, I am prepared for that. CS: When you aren’t in the gym or the cage, what types of activities do you enjoy? How do you mentally unwind after a long day of camp? MI: On my day offs, I go out to karaoke with my friends. MI: But I train all the time so during the training camp, I just train and sleep. CS: Lastly, MMA is as much an individual sport, as it is a team sport. Who would you like to thank? MI: I would like to thank Invicta FC and JEWELS for giving me this opportunity. MI: I would like to thank Chairman Yamaguchi and all of my team mates to believing in me. MI: I also would like to thank my sponsors Bull Terrier, Alienware Computers, Helmet, and HALEO.